Mohawk Honda has been serving the Albany, Schenectady, Clifton Park, Saratoga Springs, and Latham community since 1919. Over the years, we’ve sold many different models, met generations of families, and done it all by making sure we always satisfy the customer’s needs. When you visit us, we go out of our way to please you. Our dealership in Scotia, New York features a 43,000-square foot facility where we display new Honda cars like the most recent Civic and Accord, have an advanced service center, and comfortable waiting areas. Our showroom is clean, modern, and a relaxing place to find your next vehicle. 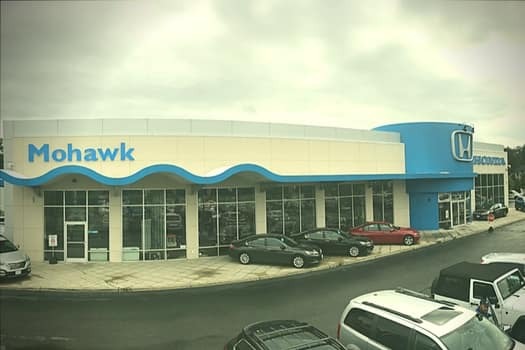 At Mohawk Honda, we believe that being a part of our community is more than just helping you find a new or used vehicle. Our team donates their time and resources to help many local groups and charities like the Deanna Rivers Foundation, UAlbany,The Chris Stewart Foundation, the Mohawk Hudson Humane Society, and many others. If you’re a member of a local organization or charitable group, please contact us. We’re always trying to better the community. Whether you’re looking for a new or used car, sell your current car, secure auto financing, service for your current vehicle, or a cool accessory, let Mohawk Honda be your local dealership. Located at 175 Freemans Bridge Rd in Scotia, we’re ready to meet all your automotive needs.